One of my friends and her husband had been teaching English in South Korea. While there, I asked if she would be willing to get me some Korean beauty products. She went above and beyond and gave me suggestions of lots of items based on what I wanted for my skin then made sure she nailed all the sales! I wanted to do a review of some of the products I've been using in addition to a few other items I've received. 1. Innisfee Juicy Apple Oil Gel Cleanser- It's an oil based cleanser that smells exactly like green apples. I love this stuff! I am not sure if I would say it is better than the Biore Oil Cleanser I did a post on a while back, but the smell is so good! 2. Innisfree Jeju Volcanic Pore Cleanser-my friend threw this one in and I am so glad she did! You need a minuscule amount for your entire face (read: pea sized). It creates a thick foam with a light scent that makes your face feel clean without being over scrubbed. It has some small beads for light abrasion. Verdict: Two thumbs up! Definitely buy again! 3. Innisfree Honey Canola Serum-this is a thick serum that helps moisturize. I haven't been using this lately since with the increase in humidity with spring I haven't needed it, but I liked it early this spring. It really makes my skin much more moisturized. Verdict: Thumbs up! Great for winter! 4. Innisfree Ginger Oil Skin Toner-a thicker toner very different than what I am used to. It's hard for me to say exactly which product has been most effective, but between everything I've been using, my skin feel more luminous and my expression lines aren't as 'expressive' at the end of each day. I'm impressed, but I might still be open to a different product just to see if it would work better. I do like the Korean toners more than the typical American ones though. They are thicker and feel like they are doing more for your skin and less like 'expensive water'. 5. Innisfree Eco Safety Perfect Sunblock- I have been waiting to use this until I'm out in the sun more this summer. After reading reviews I am excited to hear that it seems to not break anyone out and isn't oily feeling. I also like that it is SPF 50 which I think is hard to find for face. 6. Missha Time Revolution Essence-Provides soothing, hydrating, brightening, and wrinkle repairing benefits. I've read so many good reviews on this I had to get it. I like the thin texture because it absorbs quickly. I can't say what this does alone to skin since I have been using it in conjunction with other products, but I believe it has helped to brighten my skin. 7. Innisfree Intense Orchid Cream-This cream is supposed to help with wrinkles, elasticity, complexion, skin, and skin dehydration. I only used this about a week (twice a day), before I received the Olay Regenerist Cream (see review below), but I like the thicker texture and I do think it helped with my skin a little. It might be a little heavy for summer, but I plan on using it as a night cream until the weather cools down a bit. 9. Innisfree Eco Science Eye Cream-After using this a few weeks, I haven't noticed a difference in the fine lines around my eyes or my dark circles. I do like the dispenser-it's the perfect amount for both eyes. And the texture of cream is nice and thick and soaks in easily. It feels very moisturizing. But if I am going to spend my money, I want to see results. I think I am going to try other options once this is used up. 11. Emjoi Micro-Pedi- (received free for review) Getting back into running regularly has lots of positive aspects like toned legs, healthier body, it's a mood lifter, and I get to eat more (woohoo!). However it has drawbacks (the tan lines for one). Running wreaks havoc on your feet and toes. It's hard to be sandal ready with calluses so I was excited to try this. For $39.95, the Micro-Pedi helps remove dry, callused skin from your feet without pain or any risk of nicks or cute from traditional metal scraper blades and is much faster than a pumice. I personally found this very easy to use with big results. My feet are much softer and smoother. My husband loved it, too! Verdict: Thumbs up! Will be getting replacement roller. That Volcanic cleanser sounds amazing and so does the serum! Thanks for sharing your reviews! Thanks for sharing your thoughts on these products. I've been into trying out Korean skin care brands the past several months, and have been really impressed by them! Thanks for sharing this line! I have started using some Korean skincare products and have had great success. Need to check this line out! Great reviews! I've never tried that line before but now I'm curious. I also really want to try that Regenerist cream as well, so I may buy that when my night cream runs out. I tend to buy the same few skin products but I need to branch out! 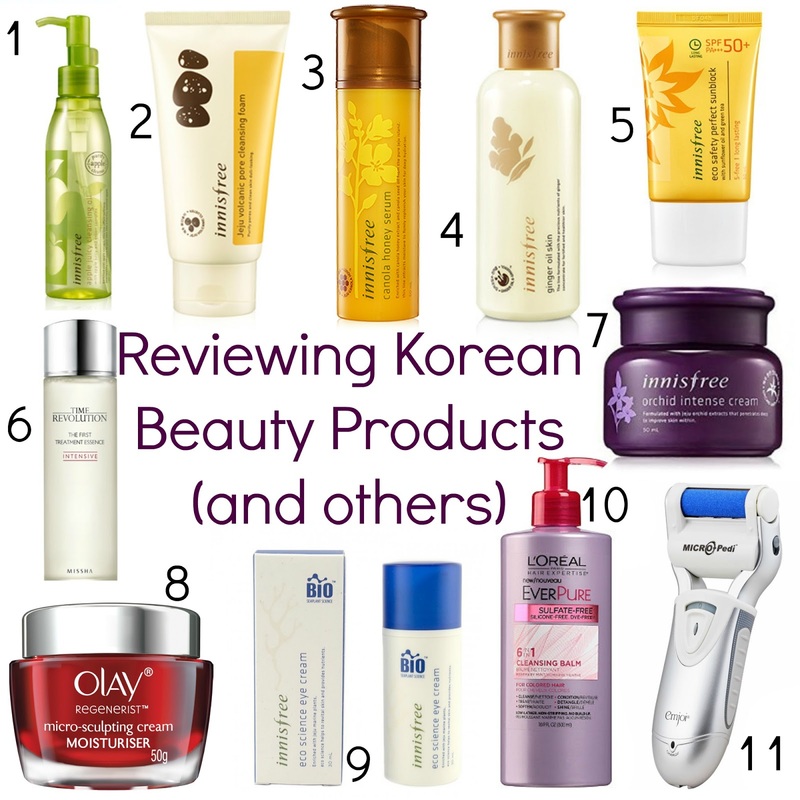 I have a friend who uses Korean beauty products so loved seeing these reviews! i love korean and asian beauty products, so this was fun!! I am so glad I read these thorough reviewes. You have been trying a lot of products. I have been meaning and need to try the Olay Regenirist and the Emjoi Micro Pedi.